"Improvements in areas like client segmentation strategies are one key example and we expect to see more as the emergence of automated investment management creates new opportunities to scale and increase productivity within advisory firms." SAN FRANCISCO--(BUSINESS WIRE)--As many independent registered investment advisor (RIA) firms surpass the 20 years-in-business mark, their revenue and profitability have achieved all-time highs according to results from Charles Schwab’s 2015 RIA Benchmarking Study (Study). Nearly half of firms (42%) participating in the Study have doubled their revenue since 2009, and assets under management (AUM) have increased by 75 percent for half of firms in the Study over the same time period, representing a compound annual growth rate (CAGR) of 12.1 percent. Along with AUM growth, profitability - measured as standardized operating margin - has risen 36 percent over the last five years and now stands at 27 percent for the median1 firm in the Study. Moreover, the gap in profitability has decreased between the most profitable and least profitable firms as the industry continues to mature and more firms adopt best practices and technology-led innovations. Now in its ninth year, the Study includes responses from more than 1,000 firms collectively managing nearly three-quarters of a trillion dollars in assets. In addition to record revenue and profitability, the data also shows that RIA firms have achieved an effective combination of growth and improved operating margins as they are increasingly institutionalizing operations and making strategic decisions around talent – not only to manage their recent growth, but also to be better positioned to succeed into the next decade and beyond. The results indicate that the sustained, rapid growth trajectory over the past five years has also helped build considerable value in many firms. Schwab benchmarking data indicates firms are not only increasing assets under management through both client acquisition and organic growth but are also enjoying high client and employee retention – attributes of business health and value. With more than $23 trillion2 in high-net-worth investor assets still held outside of the industry in other advice models, independent advisors have an immense opportunity at hand. Indeed, achieving growth through the acquisition of new clients continues to be a paramount objective—cited by 82 percent of RIAs in the 2015 Study as one of their top three priorities. Over the past five years, the number of new clients has surged by more than 24 percent for half of the Study participants, and in 2014 alone, top-performing firms3 added ten percent or more new clients, while the median firm added five percent more clients. Firms are also taking on larger clients; the average account size is now $1.9 million, and $3.9 million among the top-performing firms. Beyond new client acquisition, firms are also successfully winning and keeping the trust of existing clients as evidenced by a median 97 percent client retention rate year-over-year. Furthermore, among existing clients, firms are increasing share of wallet - top-performing firms increased share of wallet by four percent in 2014. The Study shows that the combination of new assets and larger account sizes has helped drive firm revenues over the past five years, with the median firm seeing revenue CAGR of 13.6 percent rate and top-performing firms experiencing 18.8 percent revenue CAGR. Larger account sizes have also resulted in improved revenue per professional. The median firm reported $554,000 revenue per professional in 2014 while the top-performing firms indicate revenue of more than $800,000 per professional. According the Study, operating margins are a key component of the RIA success story. Over the past five years, the standardized operating margin for top-performing firms has risen from 19 percent to 38 percent, but as more firms employ best practices and operate with greater discipline, the median standardized operating margin has increased 36 percent over the last five years, reaching 27.2 percent at the median for 2014, up from 20 percent in 2010. Client segmentation and workflow improvements have factored into improved operating margins. For example, with regard to client segmentation, twice as many firms had formal strategies in 2014 relative to three years prior. Firms are also prioritizing talent. One in four firms (26%) say recruiting is among their top priorities in 2015 with an eye toward increasing a firm’s skill set and capabilities. In particular, firms are bringing in professional management in order to better manage the challenges associated with increased operational complexity. Firms in the Study reported ‘recruiting to add skill and increase capacity’ to be the third highest priority among strategic initiatives for the year ahead. Most firms are hiring for positions that can help continue driving growth, with 76 percent of firms planning to add either relationship managers or investment professionals. Ten percent of firms seek to add ‘dedicated management’ to focus on running business operations, which can add capacity for other professionals to focus on client service and new business development. Currently, nearly half of all firms with more than $1 billion in assets employ a chief operating officer compared to 34 percent for firms $500 million to $1 billion in size. The 2015 RIA Benchmarking Study from Charles Schwab, fielded January to March, 2015, contains self-reported data from 1,007 firms that custody their assets with Schwab and represent nearly three-quarters of a trillion dollars in AUM, making this the leading study of its kind in the RIA industry. Schwab designed the Study to capture insights on the RIA industry, based on survey responses from individual firms. Since the inception of the Study in 2006, more than 3,000 firms have participated, with many repeat participants. The 2015 Study provides information on topics such as asset and revenue growth, sources of new clients, products and pricing, staffing, compensation, marketing, technology, and financial performance. Schwab does not independently verify the self-reported information. Participant firms represent various sizes and business models. They are categorized into 12 peer groups— seven wealth manager groups and five money manager groups, by AUM size. Unless otherwise noted, Study results are for all firms with $250 million or more in AUM, representing the vast majority of total assets managed by this year’s participants. The Study is part of Schwab’s Business Consulting Services, a practice management offering for RIAs. Grounded in the best practices of leading independent advisory firms, Business Consulting Services provides insight, guidance, tools, and resources to help advisors strategically manage and grow their firms. 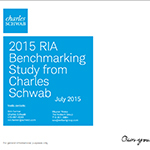 Results from the 2015 RIA Benchmarking Study from Charles Schwab.